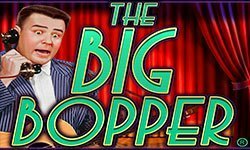 Get ready to tap your toes, hum along and be bopping in your seat with the one and only Big Bopper®! A brand new game from Realtime Gaming (RTG) coming soon to the Grand Vegas online casino. Hellooooo Baby! Welcome to a whole new world of song, dance and free games as the Big Bopper® himself makes his debut on your screens. Amazing real footage of the man is accompanied by some fun retro graphics to create gaming like you’ve never seen it. © 2019 GRANDE VEGAS CASINO. All Rights Reserved.